Fanime Con. By Fans, for fans. It is no lie that this convention his held every Memorial Day weekend, thus making it a well-known and popular convention. it is run by fans, for the fans. The location for the convention is the San Jose Convention Center. Now, for some attendees, myself included, drive in or fly from various locations around the United States for this specific convention. If the hype on the ride to San Jose doesn't get you, seeing fellow cosplayers always does. I will not lie. This convention was amazing. It wasn't just the special guests, but atmosphere is enough to make this convention worth the long drive/flight. The aura at this convention is warm and welcoming, unlike some popular California conventions during the Summer. Sure, this convention isn't perfect, and most conventions are as there is always some kind of flaw or two, but this has been one of the more enjoyable cons I've attended since I started going to conventions. Being a twenty-four hour con is a perk. There is always something to do at any given time of the day. From panels to karaoke, it is easy to see why this convention is popular among the cosplay community. This year's guests were beyond amazing. How this convention books their guests is astounding. Doug Walker, The Nostalgia Critic, know for reviewing bad movies, was one of the guests this year. Other guests included Erica Mendez, Chris Carson, and Lauren Landa were just the tip of the iceberg. The three mentioned are American voice actors. They've played roles everyone in the anime community knows. For example, Erica Mendez is known for her role as Ryuko Matoi in Kill la Kill and Nico Yazawa from Love Live!. Chris Carson is best known for his role as Mr. Popo and Tien Shinhan from Dragon Ball Z and Holy Roman Empire from Hetalia: Axis Powers. Along with Erica Menzez, the two have worked together in one of the newest Gundam series Iron-Blooded Orphans. Lauren Landa is known as Kyoko Sakura from Puella Magi Madoka Magica, Leia Rolando in Tales of Xillia/Xillia 2 and Annie Leonhart from Attack on Titan. Two of the big name guests that caught my attention were Kanae Ito and Hideo Ishikawa. Kanae Ito works with Aoni Production. She is known for her role as Yui from Sword Art Online. Hideo Ishikawa is a veteran Japanese voice actor. He is affiliated with Aoni Production as well. He is known for many roles. However, Itachi Uchiha from Naruto is one of his biggest roles. However, while I know him as Itachi, what caught my eye the most was the fact he is Squal Leonhart. Being a fan of Final Fantasy VIII, this is what made my decision to get the Final Fantasy VIII official guide book signed. 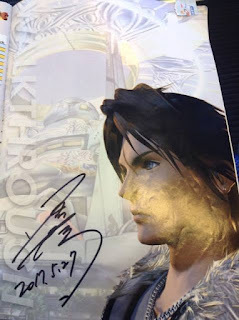 Below is the picture of the page he autographed. Funny story. There was a mishap on the day I was going to get an autograph, everybody who wanted Kanae Ito's autograph, as her session was the same time as Hideo Ishikawa's session, arrived at the same time, causing a huge fall back. A few others and I had secretly started a line inside the karaoke room around 4:15 pm, as that was the time we were told to start lining up for the 4:30 pm autograph session. There was a limit as to how many people could get in, so no doubt people were turned away due to the limit. The staff handled the situation in a professional manner, despite the matter that had occurred. X4 was this year's musical guest. The group formed in 2015 as a four member voca and dance group from Osaka, Japan. One of their members, Yuya Matsushita was a part of MusicFest in 2011. Well-known cosplayers were invited as well. Vampy Bit Me and Aicosu attended the convention. Vampy Bit Me, or Linda Le, is quite famous. She has been featured on Marvel.com. Her latest cosplay collaboration was was at PAX East as D.Va from Overwatch. Sheila and Sylar, the cosplay team of Aicosu, were the MCs of the Cosplay Masquerade. The couple have traveled and attended to 50 conventions and made over 200 cosplays. They are known to answering questions about cosplay. Quite helpful for those starting out or have questions on certain things retaining to cosplay. The rest of the convention was really not out of the ordinary. Artist Alley was as crowded as usual. The same for Dealer's Hall. However, some local vendors decided to open stands up inside Dealer's Hall. One stand was serving takoyaki and another milk tea and boba. Smart move on their part. These stands fed hungry cosplayers and attendees. Not too expensive. In fact, the Thai tea was delicious. An affordable price too. The food places around the convention area are all relatively cheap, especially if you're on a budget. Most attendees are, so this is why I am glad the local restaurants have good prices for food. The Black and White Ball is a must for those who wish to dress up formally and dance. However, given the name of the event, it speaks for itself. There is a dress code, so certain rules do apply. In fact, there were guidelines as to what was okay to wear and what wasn't. An example of this. If a male who wanted to attend was wearing a short sleeved button-up, t-shirt, tank top or anything that was not formal looking, then they would not be allowed in. The dress code was strictly enforced, as it is every year. I spoke to a few people who attended the event last year. The year before, this dance was held in one of the hotels in a ballroom. This year, the room was downsized. The room was the same room the practice dancing was held in. So, again, downsized. This was a flaw, if I do say so. But, who am I to judge. There may have been problems with renting a large ballroom for this dance. So, those with claustrophobia would have a problem if the room was full of people. The gatherings are what most people go for. Myself included. The one gathering I did attend was the Fire Emblem gathering. It was run very smoothly. The host called each game in order. Those cosplaying from a certain game could go up and have their picture taken. Fire Emblem: Echoes of Valentia has just come out. It is the newest game for the franchise. Fire Emblem: Heroes is a mobile game that came out earlier this year. Very popular among the franchise's fans. Over all, this convention is worth the drive/flight. It isn't too overwhelming and there is something for everyone there, and with it being a twenty-four hour convention, there is no reason to be bored. The locations outside are good for photo shoots. The construction from a few years back paid off, in my opinion. There are more areas for gatherings. The hotels are close by and if you get hungry, there is always a restaurant nearby. If you have never been to Fanime, please do go. It is family friendly, unless stated otherwise. I recommend this con.